Then you must cease trusting in what you can do for God and put your complete trust in what Christ has done for you. Receive Him into your life as your Lord and Saviour. He is knocking at the door of your heart and life right now. "Behold, I stand at the door, and knock: if any man hear my voice and open the door, I will come in to him, and will sup with him, and he with me" (Revelation 3:20). If you were to pray and ask Christ to come into your life right now, do you believe He would? Would you like for Him to come in and forgive you, change you, and give you eternal life? If this is what you want, pray this prayer right now: "Dear God, I know I'm a sinner, I know I deserve hell, but I believe with all of my heart that Christ died for me and than only He can save me. Please come into my heart and life and be my Lord and Saviour. Thank You for saving me, Amen." Feelings? We are saved by faith, not by feelings. Some people have emotional experiences when they receive Christ, others do not. God promises salvation not feelings. Watch for changes in your desires, attitudes, and habits. 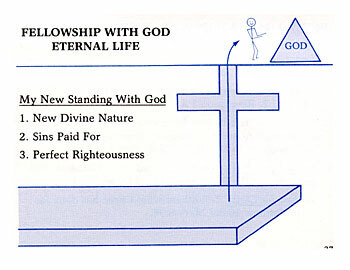 NOW THAT YOU HAVE CHRIST, YOU HAVE ETERNAL LIFE: "And this is the record, that God hath given to us eternal life, and this life is in his Son. He that hath the Son hath life; and he that hath not the Son of God hath not life. These things have I written unto you that believe on the name of the Son of God; that ye may know that ye have eternal life, and that ye may believe on the name of the Son of God" (I John 5:11-13). According to the Bible, if you died now, where would you go? As long as you have Christ, you will have eternal life. When will He leave you? "Let your conversation be without coveteousness; and be content with such things as ye have: for he hath said, I will never leave thee, nor forsake thee" (Hebrews 13:5).